This volume of Celebrate Broadway salutes dancing: the choreographers, the dancers, and the composers and lyricists that make Broadway dance. Whether it’s the sweet foxtrot from Grand Hotel: The Musical or the Warner Brothers-type glitz from 42nd Street, dancing and Broadway are synonymous with one another (or at least they should be!). Who better to teach us how to dance on Broadway than Carol Channing as Dolly Levi in Hello, Dolly!? Thirty-one years after she created it, her performance has proved simply definitive. The choreography for “Dancing” by Gower Champion began simply and gradually developed into a blissful celebration of the joy and ease of dancing. Jerome Robbins’ Broadway was a celebration of that choreographer’s extraordinary work on Broadway. His “Charleston” from the 1945 musical Billion Dollar Baby was the stuff of Broadway legend but was lost when the show closed. When Broadway audiences 44 years later saw it they knew what the fuss was about. The stage was full of flappers and bootleggers frenetically doing the Charleston to Morton Gould’s dizzying music. Hotcha! Indeed! Bob Fosse was the director and choreographer of Redhead. It was his first time filling both roles and for his efforts he was awarded a Tony® for choreography (the first of nine). The star was the wonderful Gwen Verdon (who picked up the third of her four Tonys®) and this Tango was one of the Fosse signature highlights of the show. David Merrick’s musical extravaganza 42nd Street instantly became a Broadway legend because of director/choreographer Gower Champion’s death on the day the show opened. However, the show is his crowning achievement as a Broadway choreographer. Number after number sets out to top the previous one in choreographic ingenuity and design. For his work on 42nd Street Champion received a posthumous Tony Award® for Choreography (his eighth). Grand Hotel: The Musical was a triumph of seamless staging by director/choreographer Tommy Tune, a study in intricate patterns of movement and light transforming a single unit set into various rooms and locales throughout the Grand Hotel of the title. “Who Couldn’t Dance with You?” presents the fetching Jane Krakowski treating a dying accountant (the amazing Michael Jeter) to a deceptively simple turn on the dance floor. Bob Fosse’s musical staging of the original production of How To Succeed in Business without Really Trying is embedded in the mind of anyone who saw it. While the show was trying out in Philadelphia, Fosse and his assistant (a woman by the name of Gwen Verdon) locked themselves in a studio and took Frank Loesser’s waltzlike song “A Secretary Is Not a Toy” and turned it into the percussive showstopper that it has become. When it was presented to him, songwriter Loesser was thrilled and re-tooled the song to suit Fosse’s needs. A perfect example of collaboration among theatre artists and of the usefulness of out-of-town tryouts. The original production of Stephen Sondheim and James Goldman’s Follies was directed by Harold Prince and Michael Bennett with choreography by Bennett, so the show was full of showstopping dances. None more so than the “Who’s That Woman?” number, also known as “the mirror number.” It featured seven Follies Girls of today dancing in front of, and then behind, and then intermingled with, their former younger selves. For Follies in Concert in 1985, Tony® winner Danny Daniels staged a concert version of the number that wonderfully evoked the original. Once on This Island was one of the more beautifully staged musicals of recent years. Directed and choreographed by Graciela Daniele, the show was a Caribbean fairytale that didn’t have a wasted moment or movement. Simplicity and joy were the keys to this beautiful musical that ran over a year on Broadway and has found a sustained life in regional theatres the world over. Ain’t Misbehavin’ was the surprise musical hit of the 1977–78 season. It is the perfect example of the whole being much more than the sum of its parts. On the surface the show was nothing more than a parade of songs either by Fats Waller or made famous by him, and yet by the time the evening was over, not only was a writer and performer’s life work evoked and glorified, but a way of life was celebrated and depicted that was not only joyful but deeply moving as well. As staged by Richard Maltby, Jr., and choreographed within an inch of its life by Arthur Faria, Ain’t Misbehavin’ is simply one of the best shows in memory. Chess was first of all a hit album and one of the few (only?) shows to have a hit song that was featured in dance clubs in pretty much the form it was performed on stage. In London the show was a hit; on Broadway Chess was a critical and financial failure. On record, Chess was a definite hit. Contemporary songwriters and theatre people are always striving to find a way to harness the energy that rock and contemporary music have and bring it to Broadway. It doesn’t work often (The Who’s Tommy is a notable exception) but Chess was a good try. One hopes that the authors will try again. Before he left for a distinguished directorial film career, Herbert Ross was carving out a distinctive niche as a Broadway choreographer with such shows as I Can Get It for You Wholesale, Tovarich, Anyone Can Whistle, House of Flowers, and The Apple Tree. 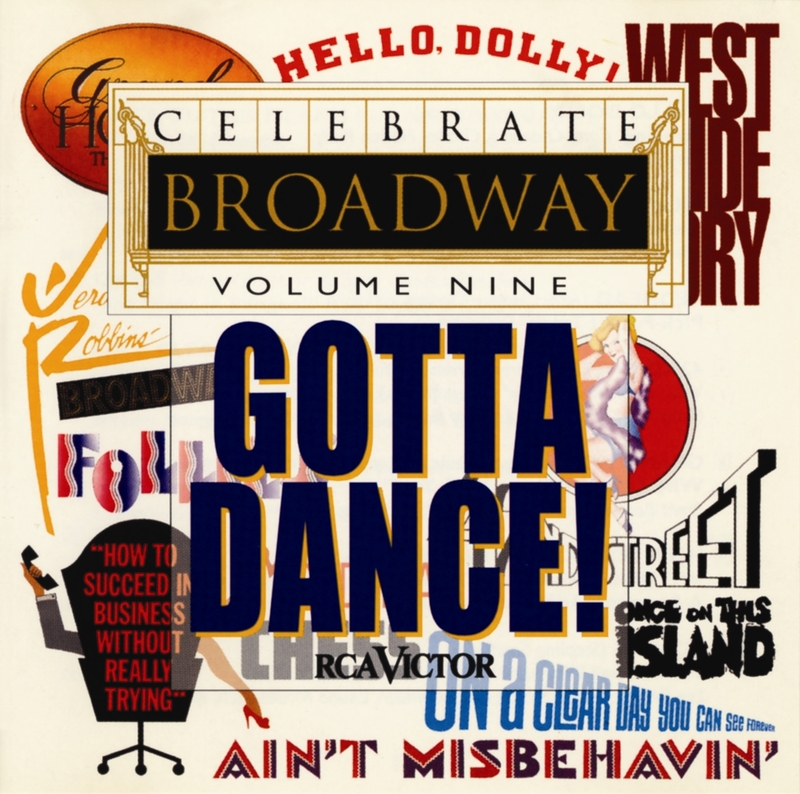 “On the S.S. Bernard Cohn” from On a Clear Day You Can See Forever isn’t one of the great musical numbers of all time, it’s just delightful and serves as a reminder that all dance numbers don’t have to make history; they just have to give an audience a good time. Then again, when dance numbers do make history, that ain’t so bad either. West Side Story was conceived, directed, and choreographed by Jerome Robbins, easily the most influential and revered Broadway choreographer of his generation. You can’t listen to these numbers and not see dance. It is the essence of Jerome Robbins’s genius that the dance you see, the dance that can’t be separated from this music, is his and his alone.